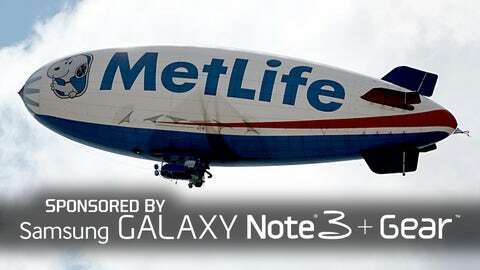 The MetLife blimp won't make it to MetLife Stadium for the Super Bowl because it's just the wrong time of year. Blimpin’ ain’t easy when the weather doesn’t cooperate, and as a result, fans will have to watch the Super Bowl this weekend without the benefit of aerial coverage. That’s according to Newsday, which reports that blimps won’t be floating around Sunday’s game between the Denver Broncos and Seattle Seahawks because the weather makes them too difficult – and potentially dangerous — to fly. "The concern really is freezing rain and snow and its accumulation on the airship," Goodyear spokesman Doug Grassian told the paper. "The additional weight can significantly change the flight characteristics of the airship and creates an unsafe scenario." The absence of the familiar aircraft at MetLife Stadium will be especially tough to swallow for MetLife itself, which is one of the major players in the blimp game. But an official from the company told Newsday that it has known it wouldn’t have a blimp at the New York area’s first Super Bowl since the game was announced. In fact, MetLife’s blimps aren’t even in town, so even a dramatic change in the weather wouldn’t alter the company’s plans to enjoy the Super Bowl without them. "They’re not up here," Winn told Newsday. "If MetLife could put its blimp up in the air here during Super Bowl week here in New York and New Jersey, we would do it." • Macklemore and Pete Carroll are pals, apparently. • Not all NBA coaches are on board with the league’s growing analytics movement. • A Little League coach who is suing one of his players for more than $500,000 says he’ll drop the suit if the player apologizes – but it doesn’t sound like an apology is coming anytime soon. • FOX Sports’ own Jay Glazer was profiled in GQ this month. • Jack Youngblood says Urban Meyer used Tim Tebow. • A Denver radio station is banning Seattle-based artists from their airwaves this week. • The Broncos’ media relations director accidentally shooed away the mayor of Jersey City because John Elway had a meeting with … the mayor of Jersey City. • Doug Baldwin says Richard Sherman was "terrible" when he initially switched to cornerback. • NFL players say they are more concerned with knee injuries than head injuries. • Jorge Posada has been working with Nationals pitcher Gio Gonzalez. • Former White Sox closer Bobby Jenks: "I literally was close to death." • Here is the story behind the Boston Celtics’ tributes to Paul Pierce and Kevin Garnett.